On the latest Expressive Mom Show, the topic of bullying was covered. 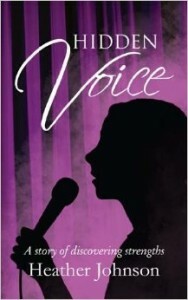 I interviewed 17-year old Heather Johnson, who is a teen author that launched her first book, Hidden Voice: A Story About Discovering Strengths. Hidden Voice targets pre-teen and teen readers. The book focuses on finding personal strengths, and life’s issues while dealing with people that surround them in school and home. The book is a short easy read, packed with drama, humor and encouragement. Heather’s main character discovers her own potential, while fighting against low self-esteem, conquering fears of failure, despite belittling attempts from various bullies. Hidden Voice, inspired by the author’s personal struggles with bullying and abandonment, now encourages others to find their strong points, passions, and self-worth, while helping them learn creative expressions through reading and writing. Heather, a student from MATSU Central School, in Wasilla, Alaska has been named the 2014 Outstanding Youth Leader scholarship winner for Government and Business, by the Spirit of Youth award program in Alaska. She has also been named an award winner for F Magazine for her submitted excerpt from her upcoming novel, Faded Portrait. Her winning Novel excerpt was published in the 2014 Summer F Magazine issue. The fact of the matter is that bullying is still a huge problem in schools, and even in colleges. You even hear about many adults being bullied at work. That being said, bullying is still a huge problem, and in many ways it has gotten worse due to the fact that there are many cases of cyberbullying with social media and technology advancing. That was one form of bullying that certainly did not exist in the old days. Heather and I spoke about the truth about bullying on the podcast, and please have a listen below. She is extremely wise and gives a lot of excellent tips for parents as well when it comes to teaching their children about the facts. The more awareness about bullying that is spread, the better we can control the issue. Kudos to Heather for writing such a powerful book! Way to go!